Wouter Poels (Sky) broke away on the final climb to win Saturday’s fourth stage and take the overall lead at Tirreno-Adriatico. A late escape containing Michele Scarponi (Astana), Giovanni Visconti (Movistar), Julian Arredondo (Trek Factory Racing) and Dani Moreno (Katusha) had been off the front with 13km and one climb remaining in the 226km stage from Indicatore to Castelraimondo. But they couldn’t make it stick, and with less than 11km to go it was gruppo compatto, thanks to a chase by Tinkoff-Saxo. AG2R La Mondiale came forward then, hoping to set up Domenico Pozzovivo. What they did was discard race leader Greg Van Avermaet (BMC Racing) and serve as a launching pad for Giampaolo Caruso (Katusha). Poels then shot up from behind, over the top, and into the lead with just a technical 6km descent to go. He was 19 seconds off the overall lead, and Katusha launched a furious pursuit with three riders on the sharp end of the much-reduced peloton. Poels had 14 seconds over the first chase with 3km remaining, while the blue jersey was nearly two minutes down. When he hit the red kite with 17 seconds in hand, it was clear that Poels would not be caught. The 27-year-old Dutchman took a couple of quick looks behind before sailing across the line for the victory. Rigoberto Uran (Etizz-Quick-Step) crossed second at 14 seconds with Joaquin Rodriguez (Katusha) third in the same time. Van Avermaet, meanwhile, finished 2:12 down and handed the blue jersey over to Poels, who now leads Uran by 17 seconds with Steve Cummings (MTN-Qhubeka) third at 26 seconds. The main break of the day featured Luke Durbridge and Mat Hayman (Orica-GreenEdge), who had a six-minute edge with 60km remaining. Both had been on the deck at some point and were sporting injuries and shredded kit. It was a day for that sort of thing. Alberto Contador (Tinkoff-Saxo) had to switch bikes after a mishap in a corner. 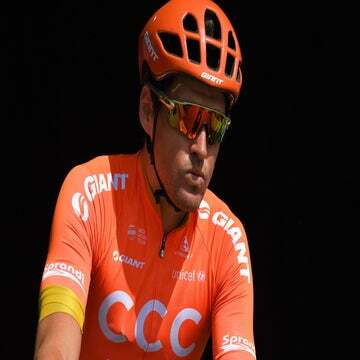 BMC Racing was leading the pursuit for race leader Van Avermaet. With 30km to go, more than five hours into the day’s labors, the gap was under four minutes and falling. And Hayman had gone off on his own. Ten kilometers further alone Hayman held less than a minute’s advantage and the peloton, led by Fabian Cancellara (Trek Factory Racing), was overhauling the Orica rider’s teammate, with Arredondo on his wheel. The catch certain, Angel Vicioso (Katusha) had a dig. Scarponi went next, and Visconti and Arredondo joined him. The three went over the Crispiero together. The final climb awaited with 10km to go. Visconti was the man who kept putting the hammer down. Behind, Moreno attacked, bridging to the lead trio. They shot through the start-finish for the penultimate time with just a dozen seconds over the much-reduced chase, led by Tinkoff-Saxo. Race leader Van Avermaet was tucked in neatly behind. As the catch came with less than 11km remaining AG2R La Mondiale came forward for Domenico Pozzovivo and led the way onto the final climb. Contador, Bauke Mollema (Trek), Edvald Boasson Hagen (MTN-Qhubeka), Dan Martin (Cannondale-Garmin), Nairo Quintana (Movistar) and Vincenzo Nibali (Astana) were all lurking nearby. Nobody was eager to make the first move, and with 8km remaining it was status quo. Van Avermaet was starting to show some chinks in his armor, drifting backward in the bunch as AG2R pushed the pace with Alexis Vuillermoz. And then he was gone, out the back, with teammate Brent Bookwalter for company. Van Avernmaet was disappointed to lose the jersey, but took things in stride. “I already knew on the first of two passages that it wasn’t going to happen,” he said. “I normally would have the legs, but I could already tell it wasn’t going to be my day. By the second, I lost a bit of morale, and I couldn’t stay with them. As for Mollema, who sits seventh overall at 28 seconds, he was already looking forward to Sunday. “I felt pretty good on the climb, and I could keep with the tempo, so that’s a good sign,” he said. “I hope tomorrow the weather holds, and we can do the entire climb. I want to go the full distance, because the legs are feeling good, and I think I can get a good result. Editor’s note: Andrew Hood contributed to this report.